People across the country are gearing up for this weekend’s Super Bowl, starting with the basics: “When is the Super Bowl?” They’re also researching some of the major characters of Sunday’s face-off—namely Seahawks running back Marshawn Lynch and Patriots coach Bill Belichick—and getting the jump on the ads on YouTube (you’ve already watched more than 100 million minutes’ worth! ), including a controversial GoDaddy ad. Plus, no game day is complete without the food: top recipes searched this week include [easy chili], [fajitas], [baked chicken wings] and [barbacoa]. 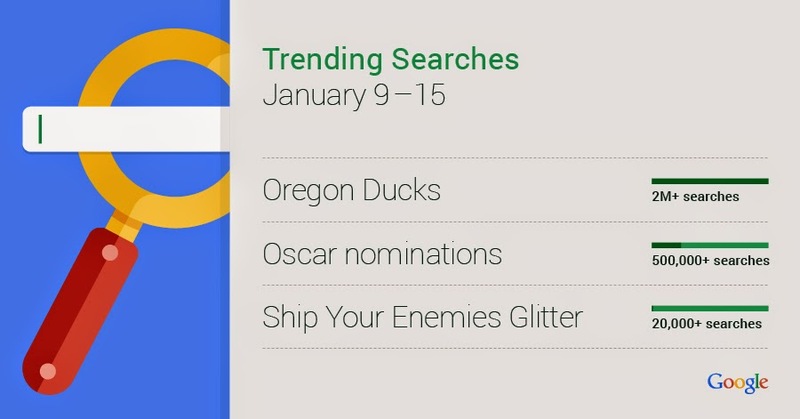 Don’t forget to tune in to @Google over the weekend for more trends! With all the football hubbub, people still found time to search for other sports happenings. Last Friday, baseball fans mourned the death of Ernie Banks, a.k.a. Mr. Cub, a beloved shortstop and Hall of Famer. And that same night, Klay Thompson of the Golden State Warriors scored a record-breaking 37 points in one quarter. An all-female Ghostbusters, that’s who. Rumors about next year’s reboot of the 80’s classic have been looming over us like the Stay-Puft Marshmallow Man for a while now, but now it’s all but confirmed that the 2016 film will feature Kristen Wiig, Melissa McCarthy, Leslie Jones and Kate McKinnon. Searches for each of the actresses spiked faster than you could say “proton pack,” and Kate McKinnon was the #2 search overall on Tuesday. In other leading-lady casting news, Harry Potter alum Emma Watson announced that she’ll play Belle in Disney’s forthcoming live-action Beauty and the Beast. Headed into this week, the weather was on everyone’s mind, at least on the East Coast. Searches for terms like [weather], [blizzard 2015], [juno], [National Weather Service] and [weather NYC] were all hot—or, cold, as the case may be. People were also looking for info on the [mta], [nj transit] and [school closings]. Though the storm in New York amounted to little more than an excuse for a snow day, it dumped up to three feet of snow in parts of New England. Definitely enough to merit all those pre-storm searches! And moving from the blizzard to the desert, Michelle Obama made headlines when she appeared in Riyadh to mark the death of King Abdullah—without a veil or headscarf. Searches spiked as people tried to find out if the First Lady intended her attire as a political statement. Others noted that she’s certainly not the first to go bareheaded: Hillary Clinton, Angela Merkel, Laura Bush and Condoleezza Rice have, too. Don’t show up empty-handed on Sunday: say “Ok Google, remind me to pick up guacamole when I’m at Safeway” and the Google app will help you be a good guest. New construction research is poised to make big waves both here and far abroad. We've been working in partnership with the University of Washington (UW) to find ways to reduce the noise created by underwater pile driving that will not only benefit and protect marine wildlife in the Puget Sound, but may also change marine construction practices around the globe. 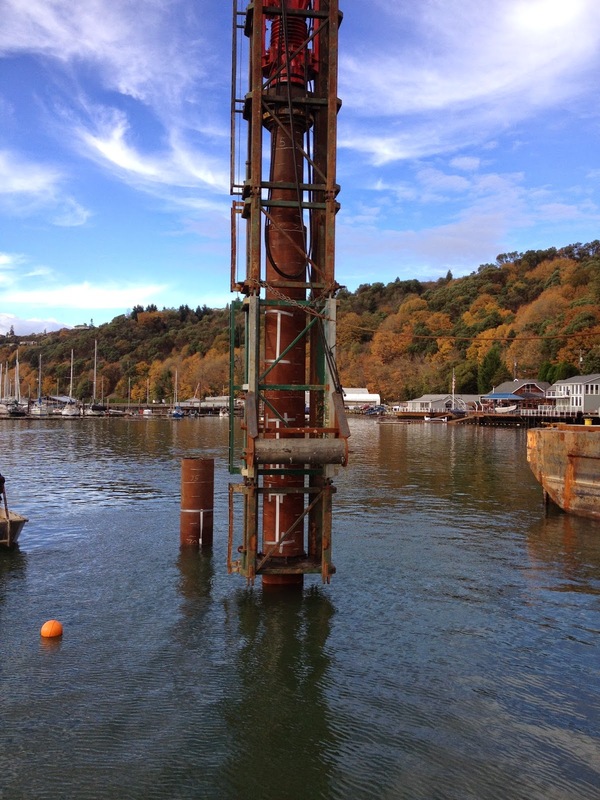 Piles are long poles or tubes driven into the seabed to provide the foundation support for ferry terminals, docks, bridges and other structures. The noise created by hammering the piles into the seabed floor is easily carried underwater and can harm, and even kill, sensitive marine wildlife. As a result of those impacts, strict regulations on marine construction projects make them expensive and challenging to complete. Our team of researchers, and environmental, construction and ferry engineers has worked with scientists to study the detrimental effects of underwater pile driving on marine environments for years. In 2008, the team invited both the construction industry and the academic fields to come up with a quieter pile design solution. UW's Mechanical Engineering department submitted a winning proposal for a new pile design technology. With our research-funding support, UW engineers and graduate students studied the mechanics of why pile driving is so loud, how the sound is transmitted underwater and how to reduce that sound. With this knowledge, they created a double-wall pile design that confines the installation noise within the pile itself. With ongoing development of this innovative project, interest has spread and multiple agencies have now joined us, including the National Oceanic and Atmospheric Administration, with monitoring assistance from the National Marine Fisheries Service. 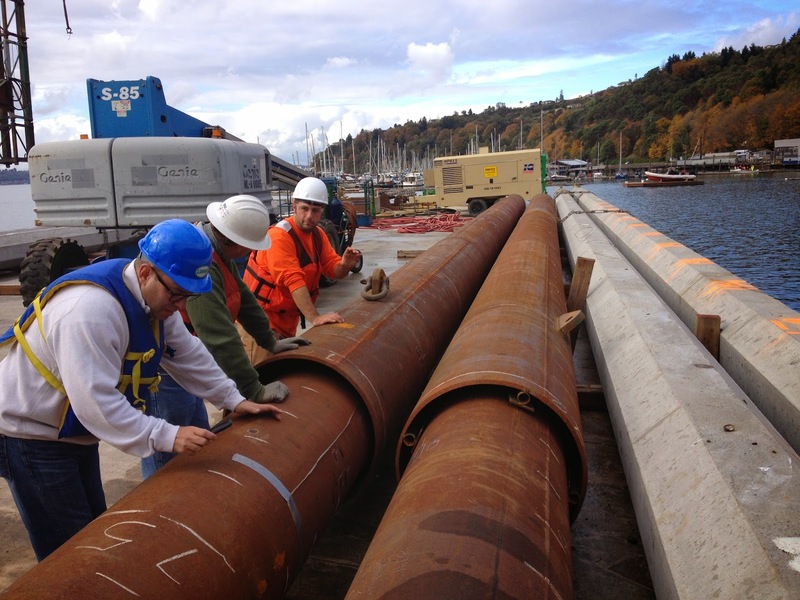 This summer, full-scale field testing of this new design will be conducted in coordination with the Port of Tacoma at Commencement Bay. We anxiously await the test results, which have the potential to reduce marine construction costs and protect the environment, not just in Washington state, but in waterways around the world. For more information on this project and other research benefits, contact WSDOT Research Director Rhonda Brooks. It’s already late January and Snoqualmie Pass has only received about six feet of snow. There should be at least 17 feet of snow by now, so you could say it’s been a mild winter so far. Although this isn’t good news for skiers, snowboarders and winter recreationalists, it’s pretty good news for us. Our contractor, Atkinson Construction, has been able to keep working on the I-90 Snoqualmie Pass East project, which is widening I-90 from four to six lanes and building two new bridges to keep avalanches from hitting the roadway. Due to snow and the rising water level of Keechelus Lake, crews usually have to wrap-up construction by mid-October. However, the mild weather allowed crews to extend their construction schedule by more than two months and work right up to the first part of January. 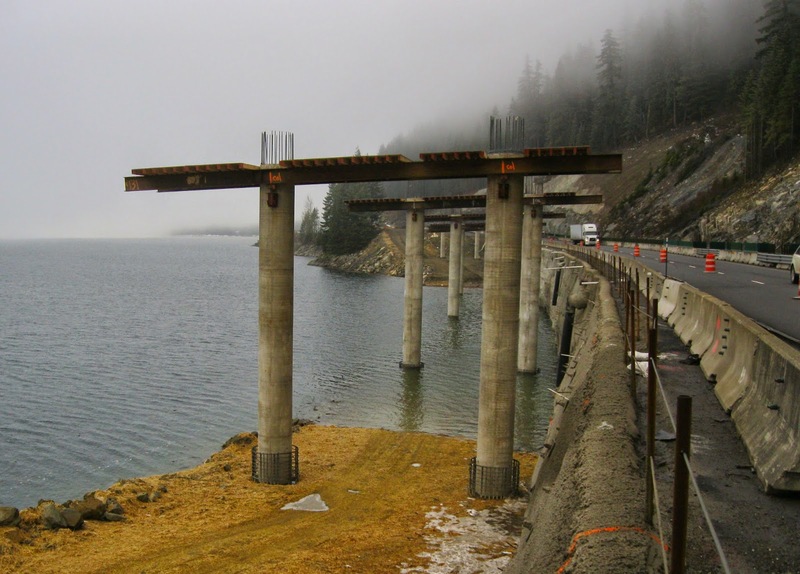 Crews were able to finish installing all nine of the bridge piers needed for the new eastbound avalanche bridges just as the water levels of Keechelus Lake started rising. The extra time spent working this winter will allow crews a little bit of a head start when construction to install the girders of the bridge deck resumes this spring. But the bridge piers aren’t the only major progress crews made on the I-90 project. A number of structural walls were constructed to make room for new lanes including a major wall for the new westbound lanes, more rock slopes above the roadway were stabilized and the westbound bridge at Resort Creek started to take shape. Although the I-90 project is progressing, crews still have quite a bit of work ahead of them. Starting this spring crews will continue building new lanes and bridges and stabilizing rock slopes. This portion of I-90 is schedule to be complete and open to traffic in 2018. This spring will also mark a major milestone when crews break ground on the next two miles of the I-90 project, which continues widening the roadway east and includes one of the first wildlife crossings in the state to be built over the roadway. This time of year may be cold and dark, but there was plenty to brighten our days—and keep us searching—this week. El Capitan is a stunning sight on a normal day—the sheer granite face rising above the valley in Yosemite National Park is hard to miss. But this week, people around the world had an extra reason to keep their eyes on El Cap: two mountain climbers, Tommy Caldwell and Kevin Jorgeson, made history on Wednesday when they completed the first ever free climb of the 3,000-foot wall. Searches for [el capitan climb] went up more than 1,000% as people looked to learn more about the feat. We’re officially in peak entertainment awards season. The “72nd and final” Golden Globes took place on Sunday with hosts Amy Poehler and Tina Fey. Of particular interest on search were Jane the Virgin and its star Gina Rodriguez, whose win was considered a surprise and whose speech was considered a win, and The Honourable Woman’s Maggie Gyllenhaal, who gave a quietly passionate speech about women in Hollywood. And Michael Keaton, who won best actor in a drama for the film Birdman, brought some company with him to search, as well as the ceremony: his son and “best friend,” Sean Douglas, who spiked in search after Keaton sang his praises in his acceptance speech. Then just when we’d finished analyzing the Globes’ winners and losers, the Oscar nominations were announced, meaning we officially have just over a month to catch up on all the films before the ceremony on February 22. Top nominees include Birdman, The Grand Budapest Hotel, and Boyhood. (Someone get Sean Douglas a tux rental for February.) Want help with your Oscar pool? There’s no telling which film will win, but over the past year, the title of top film in Search is a close race between Boyhood and The Grand Budapest Hotel. Finally, in addition to all the glitz on the red carpet, there was a different kind of glitter in search this week. A start-up business that lets you “ship your enemies glitter” went viral, giving you a new way to show that special (un)loved one how you feel. Millions of clicks and a website crash later, the founder is now saying he wants to quit. All that glitters is, apparently, not gold. Time to catch up on all those movies you haven’t seen. 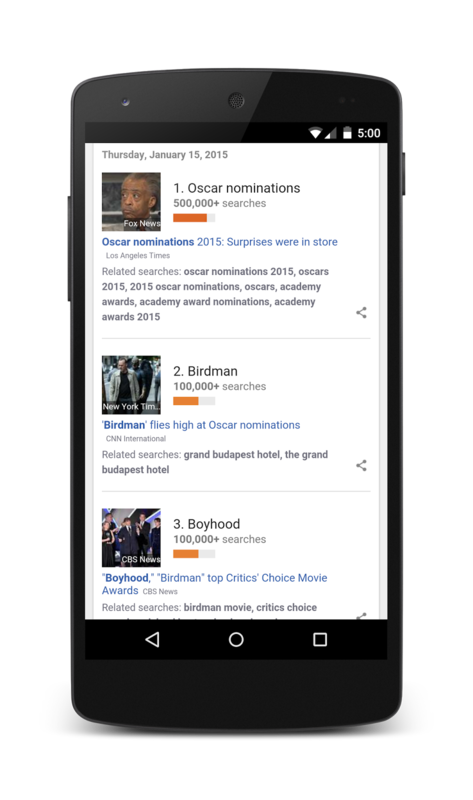 Just say “Ok Google” then “movie times” or “Selma movies times” and you’ll get a list of theaters and films playing near you. This Monday, January 19, we’re celebrating the life and legacy of Dr. Martin Luther King and marking the national MLK Day of Service. It’s a holiday that’s especially meaningful this year: 2015 marks the 50th anniversary of the Selma to Montgomery March, and it’s a time when civil rights is at the forefront of our national conversation. Next Monday, Googlers across the country are heeding the call to give back to their communities, and we hope you’ll join us. Take some time to honor Dr. King by volunteering in your community—you can find opportunities at All for Good. 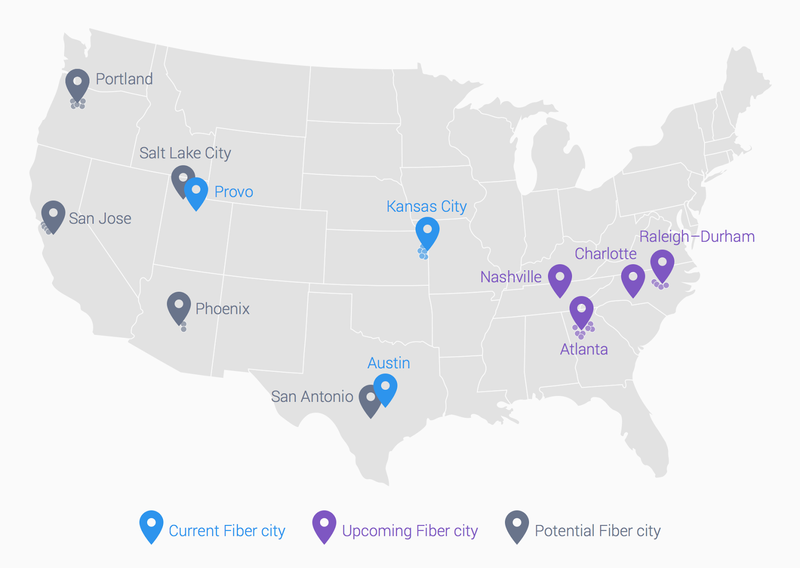 In the meantime, here’s a look at some of the projects Googlers will be participating in, and the reasons why they’ve made the commitment to serve this MLK Day. Leadership coordinator Aerica Banks says that she serves to ”break down barriers and build community. We are all able to serve, and we all stand to benefit.” She helped organize volunteers in our Atlanta office for the Atlanta Food Bank Kids In Need program event, which provides school supplies free of charge to teachers in low-income schools. Traffic has returned to the State Route 508 South Fork Newaukum River Bridge near Onalaska in Lewis County. For the safety of the public, WSDOT crews closed the bridge Sunday, Jan. 11. Since then, WSDOT maintenance crews were busy building a temporary “Bailey” bridge over the existing structure. The bridge was weight-restricted in 2012 because heavy loads put additional stress on aging steel truss members. Bailey bridges were first used by Allied forces during World War II to move heavy equipment, like Sherman tanks, over rivers and ravines. Instead of troops in green fatigues, WSDOT maintenance outfitted in safety orange vests and yellow hard hats worked like a small army to assemble pieces of the bridge. Each part moved into place by hand and was fastened together. Once assembled, the crews slid the Bailey bridge into place using a series of rollers. The SR 508 Newaukum River Bridge is essentially two separate spans. Part of the bridge is steel, which as you can tell by the rusted I-beam in this photo, is deteriorating. The other part is supported by timber, which is still in decent shape and safe to use. We only had enough bridge deck to span the steel portion of the existing structure, and it would take an additional three months to acquire more pieces. The solution was to span the Bailey over the steel sections and reinforce the timber piers. To do this, we used hydraulic jacks to lift the bridge half an inch to slide in new pieces of steel. This also allows for legal loads to again use this route. Crews built ramps to the Bailey on Tuesday, Jan. 20. Before the temporary bridge was opened to travel on Wednesday, Jan. 21, barrier and striping work was completed. All of this makes the most of the available resources, and will allow traffic to move safely across the bridge until the new structure is completed in 2018. Many drivers have seen a blue flash above the HOV lane on Interstate 405 north of State Route 522. A few have asked us what it is. It’s part of the toll equipment that will anchor 17 miles of new express toll lanes on I-405 between Bellevue and Lynnwood in late 2015. Throughout 2014, crews were installing towering green structures over the roadway, known as gantries. 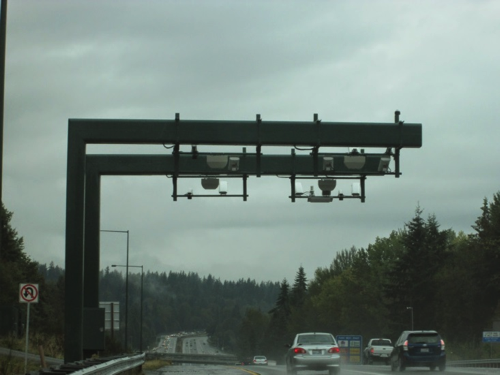 Now they are outfitting those gantries with the gadgets that will allow tolling to work, including toll readers, cameras and special beacons that help Washington State Patrol with enforcing proper use of the lanes. The blue flash you’ve seen is from testing the toll cameras that will help us take photos of a vehicle’s license plate. You may have seen a similar flash if you’ve used the SR 520 bridge. After we install the cameras on I-405, we need to make sure they are ready to take photos day and night as we work to get the system up and running and ultimately start tolling in 2015. Based on feedback we heard from drivers, we made adjustments to the camera flashes up north, decreasing the intensity and changing the angle. We’ll use the same settings on the newly installed cameras. This, along with more ambient lighting in the south, should make the flashes less noticeable. 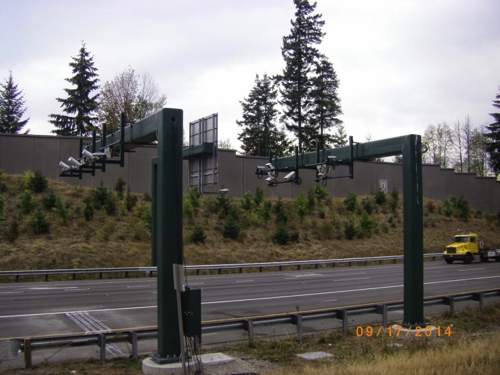 Crews wrapped up installing toll equipment north of SR 522 last year. Now they’ll install equipment between Northeast Sixth Street in Bellevue and SR 522. Once everything is set up there’s still a lot of fine tuning and testing to be done before we can open the express toll lanes to drivers. In the meantime, no tolls will be charged, and the HOV lane will continue to operate the same way it does today. On Tuesday, Jan. 20, and Thursday, Jan. 22: Up to three lanes of southbound I-405 will close between Northeast 160th Street and Northeast 124th Street from 7 p.m. to 4:30 a.m.
On Wednesday, Jan. 21: Up to two lanes of southbound I-405 will close between Northeast 160th Street and Northeast 124th Street from 7 p.m. to 5 a.m. These closures are subject to change, so for the latest information, make sure you check our I-405 construction updates page. The work we’re doing is part of a project to convert the I-405 HOV lane between Bellevue and Lynnwood to an express toll lane. In addition, between Northeast Sixth Street in Bellevue and SR 522 in Bothell, we’re building a second express toll lane to form a dual express toll lane system in both directions of I-405. Why build express toll lanes? If you use I-405, we don’t need to remind you that the highway experiences some of the worst traffic in the state, and the HOV lanes are full during peak periods. One of the primary objectives of the express toll lanes is to improve traffic performance. The new express toll lane between Northeast 6th Street in Bellevue and SR 522 in Bothell will be paired with the existing HOV lane, to create two express toll lanes in each direction. This additional lane capacity, combined with dynamic toll rates that adjust based on traffic conditions, will allow us to manage traffic flow better and move more vehicles faster than we do in today’s carpool lanes. In 2013, the I-405/SR 167 Executive Advisory Group composed of local elected officials and transportation agencies recommended a carpool policy where 3+ carpools ride free during peak times and 2+ carpools ride free at off-peak times. It will be up to the Washington State Transportation Commission to finalize this policy through a public process in the next few months. Our traffic models predict that keeping a two-person carpool requirement will not allow us to meet our state and federal mandate of 45 miles per hour, 90 percent of the time during peak periods. Still, if we simply changed the carpool definition to 3+ without express toll lanes, the lanes would be underutilized. By building express toll lanes, we can fill those lanes back in by giving drivers the choice to use them. As more drivers use the express toll lanes, traffic moves faster in the regular lanes, which will remain toll-free. Still have questions about how the lanes will work? Check out our FAQs. 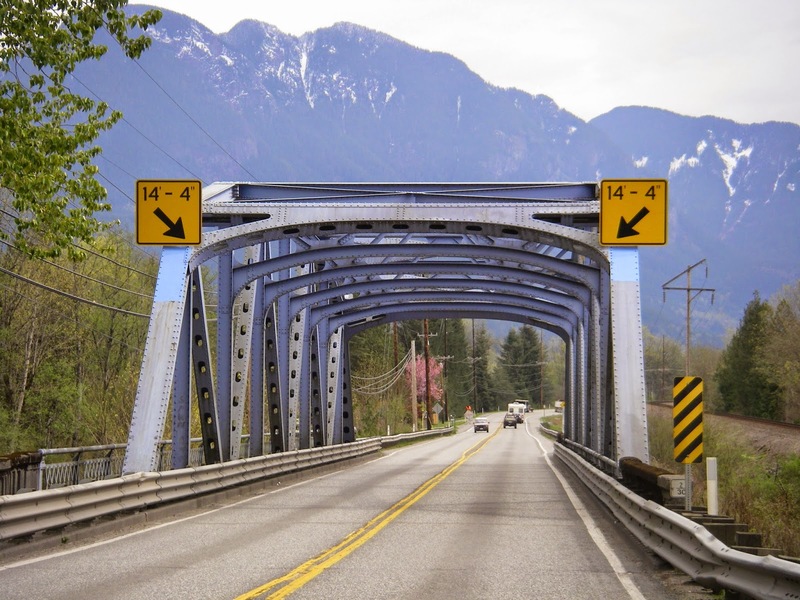 Many of you no doubt remember the collapse of the Skagit River Bridge in May 2013 and the dramatic images of the bridge and vehicles in the water. drivers make safer travel decisions. The bridge fell after an oversized commercial truck struck it, sending a part of Interstate 5 and two vehicles into the river. All the drivers survived, but, tragically, Washington State Trooper Sean O’Connell was killed while managing detour traffic. Traffic on a key freight and transportation corridor also was severely disrupted. In the aftermath we worked to set up detours and repair the bridge. But we also reviewed what else we could do to help truck drivers better prepare to travel through our state. The driver is still ultimately responsible for verifying that their truck is safe for their proposed route, but we looked for ways to help – and to better protect all motorists, our bridges and our critical freight corridors. The result? 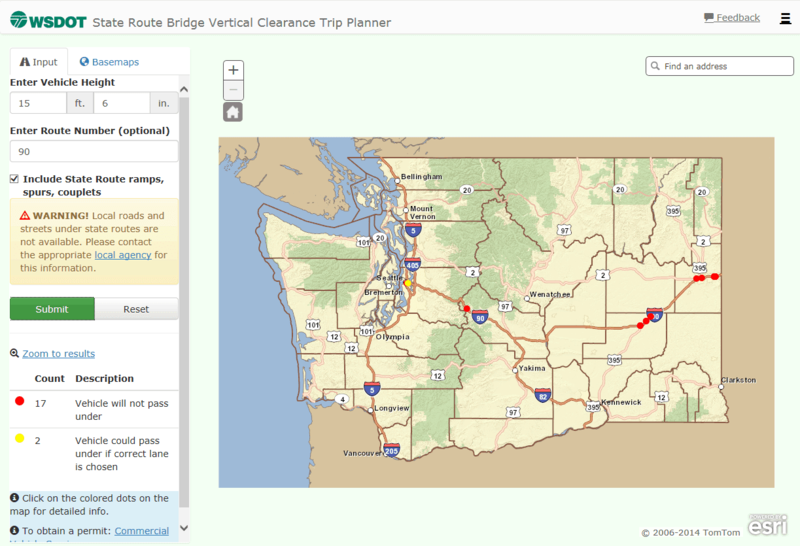 A new online “trip planner” system that allows truck drivers to more easily check for clearance hazards before they head out. As part of their permit application, drivers can now enter the height of their vehicle and then the state route or interstate number. A map displays the entire route with color-coded markers for areas that are too low or may require a specific lane for proper clearance. An additional feature is the ability to use an exact address to zoom into a particular area. See a red dot on your proposed trip map? Better find a different route or detour. Spot a yellow marker? That’s your cue to do more research about lane-by-lane clearance. Previously, drivers had to consult their own maps and then look up each bridge individually. drivers to avoid or use caution around low clearance bridges on their route. The idea behind this tool had been brainstormed here for a while. When the bridge collapsed we brought it to the forefront. We still had to create a new database and a user-friendly website, but the previous “wish list” planning gave us a head start. To make sure the product works the way truckers will use it, we also partnered with the Washington Trucking Association. Their members provided suggestions and “test drove” the system last fall as we fine-tuned the mapping tool and the website. We’re also working to add more features such as lane-by-lane clearance levels. That feature should be in place by 2017, but we’re glad to have the new tool available for use now. Would the trip planner have single handedly prevented the bridge collapse? It’s hard to say because numerous factors can combine to cause crashes. Made the new database available to third parties who have expressed interest in creating navigation and safety apps for commercial drivers. Sharing the data should get the safety information into even more drivers’ hands. Rewritten our requirements and permits for clarity. Reviewed signs on all bridges with clearance 15 feet 3 inches tall and lower. Made the commercial vehicle permit webpage more user friendly, including a step-by-step “How do I get a Permit?” section and answers to frequently asked questions about pilot car requirements. Added the trip planner tool on our road restrictions webpage. Started a comprehensive statewide review/re-measurement of all bridges 16 feet 6 inches tall or lower. This is scheduled to be complete in late 2015. We hope these steps, and the renewed awareness of the issue, will help truck drivers make safer travel decisions across our state. 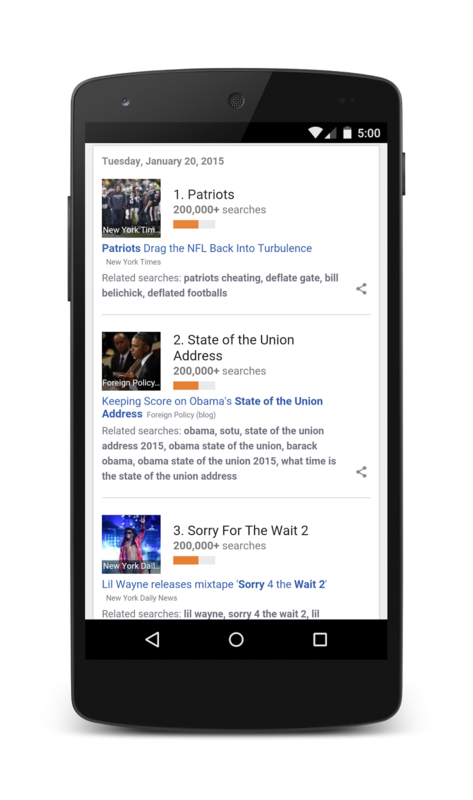 Every year since 2010, President Obama has turned to YouTube and Google after his State of the Union speech to answer questions that are top of mind for the American people. Asked through YouTube video submissions or live via Google+ Hangouts, these questions always bring an interesting perspective to the issues the president addresses in his speech. This year we’re doing something we’ve never done before: bringing a handful of YouTube creators directly to the White House to talk with the president in person in a live broadcast on Thursday, January 22. YouTube creators Bethany Mota, GloZell Green and Hank Green will interview President Obama about the top concerns facing them and their audiences. Over the next few days, the creators will ask you to share the questions you have for the president, some of which may be asked during the interview. In years past, people across the United States have used this interview to ask important questions about jobs, immigration and even Valentine’s Day. Use #YouTubeAsksObama on social media to suggest issues that are important to you or any questions that are on your mind. Finally, don’t forget to tune in on January 20 at 9 p.m. EST to watch the State of the Union address, as well as the Republican response, live on YouTube. Two years ago, the park and ride facility near the Selah Firing Center off Interstate 82 was a shadow of its current self: unpaved, under-improved and too small to adequately serve the needs of nearby residents and commuters. 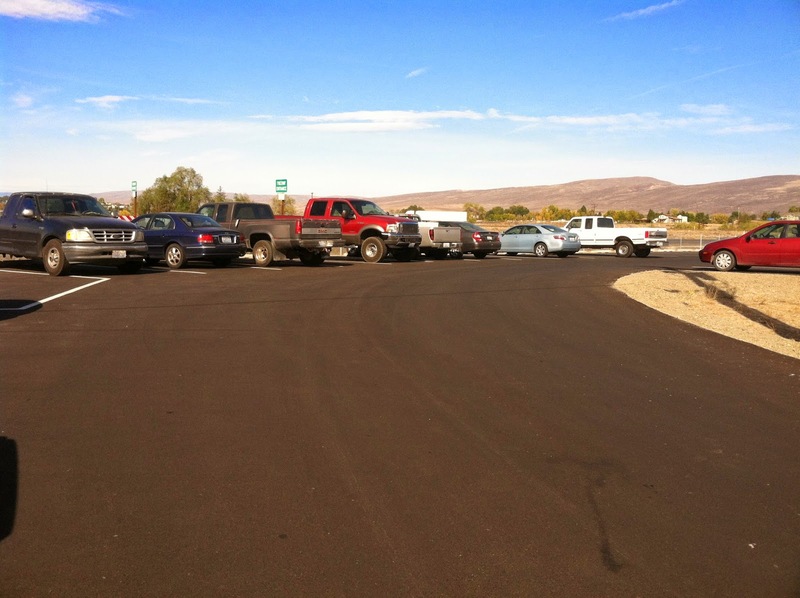 That all changed when Yakima Transit was awarded a Regional Mobility Grant by the Legislature to be used toward upgrading (and just plain grading) a cracked and graveled lot into a fully paved, lighted and landscaped park and ride facility. In the process, the newly transformed facility nearly tripled in capacity, going from around 40 gravel-pocked parking spots to 114 freshly striped stalls. And there’s room for further expansion down the road, which could bring capacity to around 150 stalls. Our staff and Yakima Transit formally cut the ribbon on the new park and ride facility in October, marking the completion of the Regional Mobility Grant program’s 50th project to date. The overall cost of the $240,000 project was greatly reduced by making use of WSDOT-owned right of way. Since the park and ride serves highway-related purposes, Yakima Transit is able to utilize the right of way for free, saving taxpayers money. Carpoolers, vanpoolers and passengers catching a ride on the Yakima-Ellensburg Commuter—mostly students, commuters, shoppers and people seeking outpatient medical services—have kept the facility at or near its capacity since it reopened. Created and enacted into law by the Legislature in 2005, WSDOT’s Regional Mobility Grant program supports local efforts to improve transit mobility and reduce congestion on our most heavily traveled roadways, including enhancements to the statewide network of park and ride lots. The RMG program also bears this important characteristic: Each project must expressly align with the state’s goals for greenhouse-gas-emission reductions. Funded in statute through the state multimodal transportation fund, the program has provided $184 million to support local and regional projects since 2006. Historically, the Legislature has set aside up to $40 million every two years for RMG projects, but that amount is scheduled to increase by 25 percent in 2015. With 50 projects completed in the past nine years, the program now turns its attention toward the 26 ongoing projects around the state. The Legislature will review a list of additional project proposals during its upcoming session, awarding as much as $50 million in grants to projects selected for funding. downstream of Bear Creek in danger. A dam blocking an 80-foot-long culvert in Woodinville this week was enough to drive Ward and June Cleaver up the wall, and our maintenance crews simply couldn’t leave it to beaver. The beaver constructed the dam in the center of the culvert that runs under SR 9, just north of SR 522, near Woodinville. No word if he received help from Whitey and Lumpy. The critter’s creation was so clever and well-built that it prevented a large amount of water from an upstream pond from getting through the culvert. This caused the water level of the pond to rise and that’s when we knew this was not just your average beaver dam. So our maintenance team went to work. In order to safely clear the beaver dam, crews blocked the upstream side of the culvert to control the release of water to prevent a sudden flood, which could have put our crews in danger and affected properties downstream of Bear Creek. The culvert was blocked using a steel plate attached to the end of an articulated crane from a truck, which required the closure of the right lane of northbound SR 9, just north of SR 522. On the downstream side of the culvert, crews used a grapple hook on the end of a rope attached to a chainsaw winch (basically a giant fishing rod) to grab small chucks of the beaver dam as they slowly broke down the structure. Grapple hook used to remove small chucks of the beaver dam. Brave and cold crewmembers walked the grapple hook into the five-foot-wide culvert and dug it into the debris. After safely walking back out of the culvert, the crew started up the chainsaw winch to pull out the grapple hook. Most of the time, it carried out nothing more than a handful of rubble. Because the dam was estimated to have filled a fourth of the culvert, the process was like chipping away at concrete. Occasionally, the crew would lift the steel plate up to allow water to flow into the culvert with hopes that the force would clear more debris. After eight hours of hard work, the crew’s slow and meticulous approach allowed for the water to flush out the beaver dam. chucks of the beaver dam were removed. Why was it necessary to remove the beaver dam? Good question. If we would have left the rodent’s dam intact it could have caused water to undermine and damage the highway above it (SR 9) and it could have created potentially damaging flooding downstream. In the past, our crews have removed or modified beaver dams near roadways, but never under one. If you’re interested in more info on when we remove beaver dams, check out this document. So where’s the eager beaver? Hard to say. Some speculated it was hanging out with Wally and Eddie Haskell. More likely, when humans moved in, it moved on. Typically, we work closely with the Washington Department of Fish and Wildlife to make sure animals are relocated if necessary. In this case, the beaver wasn’t spotted near its dam. Those who frequent the area say they often see a beaver, but it’s usually hanging out in the pond upstream of the culvert. Wherever it is, we salute you and your engineering prowess, Mr. Beaver, but ask that in the future, you show off your skills in less potentially-hazardous spots. View the video of the beaver dam inside the culvert and how our crews removed it. 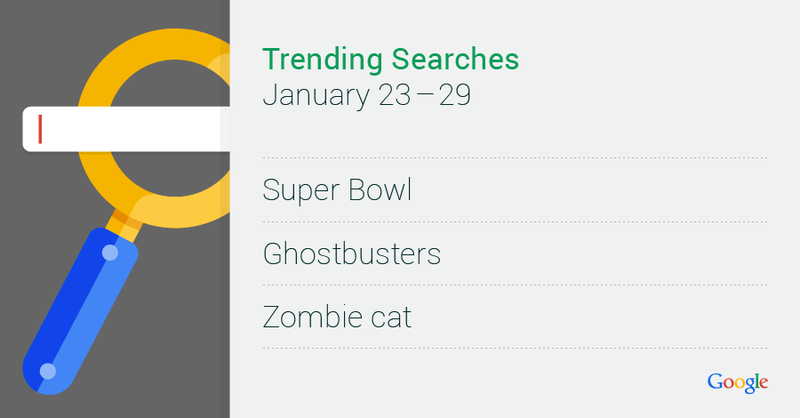 2015 may have just begun, but search is already full steam ahead. From a tragedy in Paris to buzz around the new Calvin Klein ads, read on to find out how the year got started on search. You know what they say—new year, new you. Searchers took to the Internet this week to find out how they could turn their new year’s resolutions into reality. And the usual suspects of diet and weight loss were on everyone’s list. 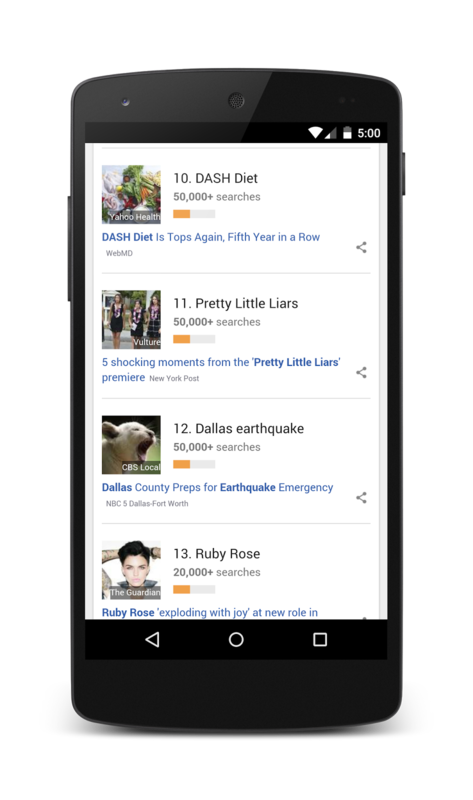 The Dash Diet made it onto the trends charts after it took the number one spot on The U.S. News & World Report’s annual rankings of the best diets. Created by physicians to help treat high blood pressure, DASH (Dietary Approaches to Stop Hypertension) emphasizes fruits, veggies, whole grains and low sodium. So long, carbs; it was nice knowing you. We’re working to get our bodies photo-shoot ready, but Justin Bieber has beaten us to the punch. “Beliebers” everywhere were left drooling over a new Calvin Klein underwear ad. Meanwhile, Justin’s campaign co-star, Dutch model Lara Stone, is getting some unwanted attention: she received several death threats from Bieber’s fans. The year’s not even two weeks old and people are already excited for what’s to come. If you blinked, you probably missed tickets for Coachella 2015, the star-studded desert music festival. The concert sold out after a mere 40 minutes! And comic book fans (and Paul Rudd loyalists) went into a frenzy when Marvel released the trailer for their latest superhero flick, Ant Man. Our take? This smells like a Millennial version of Honey I Shrunk the Kids. Finally, while many were looking ahead to this year’s entertainment, others took the time to remember a legend. This week, searchers were feeling sentimental for Elvis Presley’s 80th birthday and revisited the King’s classic songs and memorable white suits. Don’t let this be another year of resolution failure: use Google to set reminders for all of your goals. Just say “Ok Google, remind me to go to the gym” when you’re ready to commit to 365 days of sweat. Posted by Jenise Araujo, Communications Associate, who searched for [heartbreak hotel] and [gym discounts]. Several highways remain closed near the Washington coast after heavy rains brought debris down over the roadway beginning in the early morning hours of Monday, Jan. 5. We will continue to update this post when information changes. 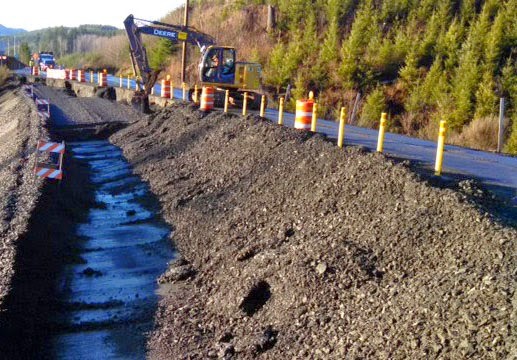 US 101 at milepost 72.6 near Artic will remain a single lane with reduced speeds and one-way alternating traffic at Rock Crusher Hill until further notice. Stop signs provide traffic control. Motorists are asked to please adhere to the stop signs in place and follow the rules of one-way alternating traffic. Heavy rains early Monday morning triggered movement at a historic landslide site. WSDOT has completed the design for a permanent repair, and has requested construction funding for the repair in the 2015-2017 biennium. US 101 at milepost 75 has single lane alternating traffic controlled by flaggers. at Rock Crusher Hill until further notice. WSDOT will opened a temporary bypass around a damaged portion of State Route 4 at milepost 3.1, just west of Naselle, Friday, Jan. 9.The road will be open to two-way traffic with a reduced speed of 15 mph. 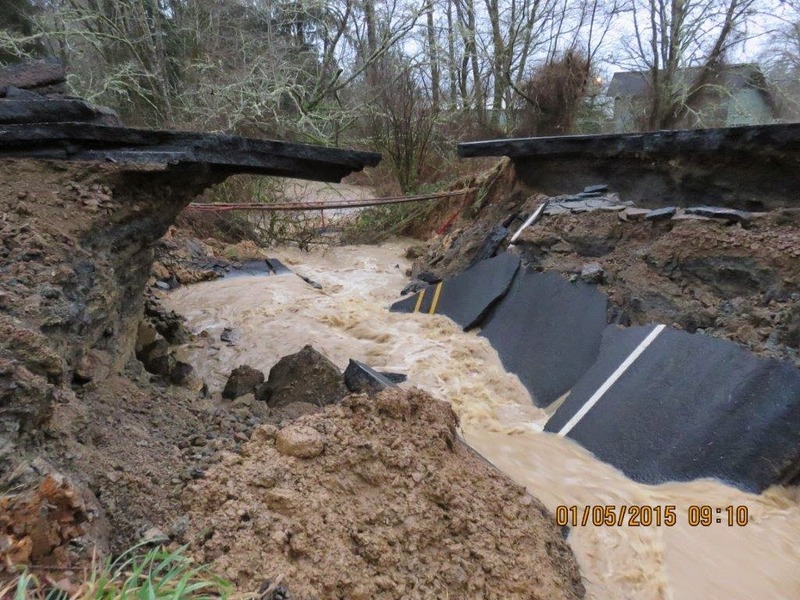 The highway was damaged when a culvert failed during heavy rain, Monday, Jan. 5. Permanent repairs to the highway and the culvert will take several months. Crews are hauling material in to construct a connection from SR 4 to a bypass road, which is an old highway that runs parallel to the damaged road. Paving work will need to be completed before it is open to two-way traffic with a reduced speed limit of 15 mph. The work is weather dependent. SR 4 wash out between US 101 and SR 401. CLEARED - Both lanes of I-90 Snoqualmie Pass have reopened. Snoqualmie Pass received more than 8 inches of rain in the past 24 hours saturating the soil causing rock fall along the slopes east of I-90. CLEARED - US 12 at milepost 1 is open to traffic in all directions outside of Aberdeen. CLEARED - SR 109 in both directions. Cleared: All lanes of US 101 (milepost 29 to 53.5) in South Bend are open. CLEARED - US 101 at milepost 64 is now open after more than a foot of water prevented travel on the roadway early Monday. CLEARED - US 101 at milepost 89 is now open after three slides blocked the roadway early Monday. Both lanes are now open. CLEARED - SR 105 all lanes are now open. Earlier a slide had blocked both directions from Smith Creek Bridge (milepost 10) and Airport Road (milepost 4.5). CLEARED - SR 203 is closed in both directions from Tolt Hill Road in Carnation to SR 202 in Fall City due to water over the roadway. CLEARED - SR 202 is closed from SR 203 to Southeast Fish Hatchery Road northeast of Fall City due to water over the roadway. CLEARED - SR 11/Chuckanut Dr. is closed between Avon Allen Rd and Field Rd due to water over the roadway. CLEARED - SR 538 is closed in both directions in Mount Vernon between Horton Road (milepost 5) and SR 9 (milepost 3). You can’t fight Mother Nature. 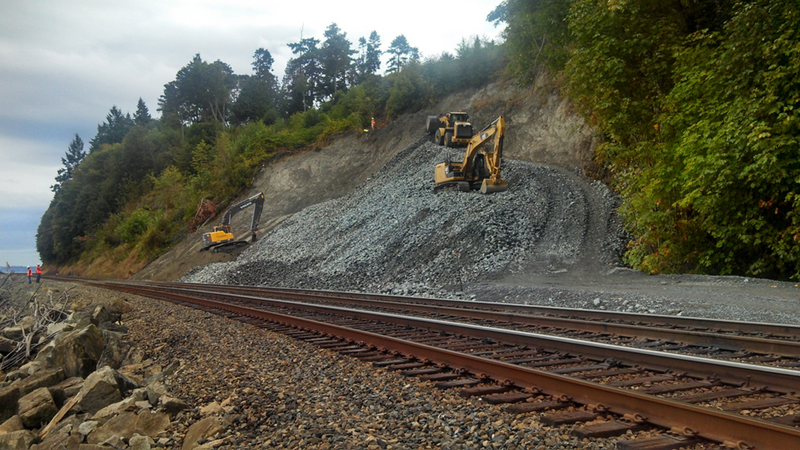 But when it comes to landslides that block rail lines north of Seattle, we’re trying to call a truce. Landslides aren’t new. Gravity, Pacific Northwest rain and steep slopes along the rail lines combine to cause the land to give way. Erosion, cutting into the bottom of the slope and poor drainage systems also exacerbate the problem. More than 200 slides have occurred along the Seattle to Everett coastline in the past decade, the most recent on Dec. 28. BNSF Railway Company owns and operates the railway. For each landslide on the north rail line, BNSF sets a minimum 48-hour moratorium on passenger rail service between Seattle and Everett. During that time, BNSF clears debris, repairs the tracks and checks the slope. While moratoriums are in effect, buses transport our Amtrak Cascades passengers between the Seattle and Everett stations to continue their train journeys. We manage the Amtrak Cascades passenger rail service along with the Oregon Department of Transportation. Amtrak operates the service for the two states. So we take train safety and landslide disruptions seriously. That’s why we’re taking steps to help prevent passenger train delays caused by landslides, including forming the Landslide Mitigation Work Group in 2013. We wanted to become proactive and asked others, including BNSF, Amtrak and Sound Transit, to join our efforts. Today, representatives from 17 agencies and private companies attend the ongoing meetings. The group researched landslide causes, identified high risk areas and wrote the Landslide Mitigation Action Plan (pdf 2.68 mb) released earlier this year. We also, along with other work group members, held three educational open houses in communities along the north rail line to allow landowners to learn about landslide risks and prevention on their property. We met with mayors and city councils this year in Mukilteo, Edmonds and Everett about the issue. And a brochure with information and prevention tips (pdf 340 kb) was mailed to landowners along the affected rail corridor. In some cases, preventive measures are simple, such as planting native vegetation to prevent erosion and reduce the risk of landslides. New or reworked drainage systems also can help stabilize the slope and safeguard property -- as well as the rail lines. As part of this process, BNSF also agreed to waive permit fees through April 2015 for landowners who connect to the railroad’s drainage system. 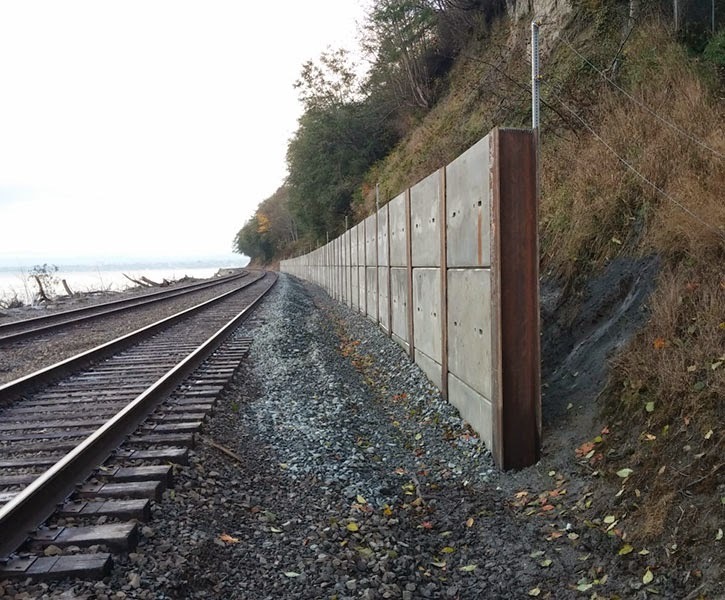 Retaining walls to catch landslide debris before it hits the tracks. Slide detection fences to give early warnings of active landslides. Two of the projects, one south of Mukilteo and another near Everett, were constructed this year. A third may be constructed in 2015. For the other three projects, funding is being explored. 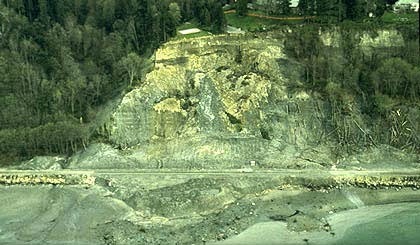 Mukilteo, can also help prevent landslides. Of course, there’s never a 100 percent guarantee when you’re dealing with landslides. But by addressing landslide risks and prevention head-on, we hope to reduce at least some of Mother Nature’s impact.